Brass flare guns filled with rock salt shells. An incredibly effective weapon in tactical situations for two reasons: 1) Sodium chloride is effective in dispersing magic in individuals who may be “hexing”. 2) High-velocity salt crystals slow down aggressors by inflicting pain without lethal consequences. A mixture of saline and capsicum in a small aerosol-type spray bottle. Effective for both dispelling magic and incapacitating an attacker by inducing vomiting, extreme watering of the eyes and swelling of mucus glands. 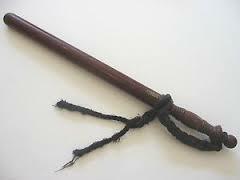 These are similar to night sticks used by Mundane police forces, but with a twist. Depending on the type of wood used, different effects can be achieved. Cedar: Effective for influence and purification. Strengthens psychic power and is often a tool for healing. Excellent for protection. Ebony: Used for the defense, reversal, and dispelling of dirty magic. Excellent for defensive magic. Wenge: Used for defense and protection. Excellent for dispelling dirty magic.